Government of Punjab has announced jobs vacancies for Arts and Science Educators on 100% merit basis in all 36 districts of Punjab. Govt. of Punjab Jobs for Teachers Arts & Science Educators 2016. School Education Department established by the Government of Punjab for purpose of improvement of education level in all the schools of Punjab Province and now this education department has announced opportunity for citizens of Punjab having minimum 16 years education degree and eligibility to teach the students are welcome to step forward and be a part of Government Schools of Punjab Province. All Interested Candidates have to pass NTS test with more than 45% marks other candidates having less than 45% marks are not allowed to appear for Interview. Candidates must Possess Academic Qualification Masters Degree and Bachelors Degree according to the relevant subject. Candidates must possess Professional Qualification B.Ed. / M.Ed. / M.A. (Edu) with at least 2nd Division. Candidates must have age minimum 20 years and maximum 30 years but there will be age relaxation for both male and female such as Males with 35 years of age and Females with 38 years of age are eligible. Candidates must have Layyah domicile to apply but females candidates have to submit Marriage certificate and husband’s domicile along with application. Candidates who passed NTS Entry Test for Educators with more than 45% are eligible to apply and will called for interview. Applicants may download application form through official site of Punjab School Department or it can also be obtained from the office of District EDO (Education). Duly filled application form along with attested copies of attested copies of educational certificate, experience certificate, NTS Result Card 2015, Domicile, CNIC, Passport size photographs, Marriage Certificate for Females and Bank Challan of Rs. 100/- in the office of EDO Education of relevant city. Interviews for the vacant positions for both Male and Female Educators will be held according to the schedule mentioned in every advertisement. Government jobs are vacant for the Arts and Science Educators in Punjab Province and candidates from all over Punjab having valid domicile are eligible to apply. 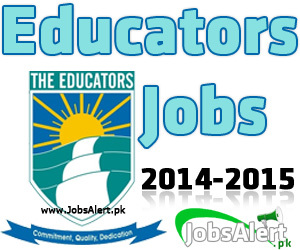 Here at this page we’ve provide you the list of all 36 districts in which vacancies of Educators are available, all you have to do just following the list given below and by visiting following districts you’ll have complete information about the vacant positions of Educators in every 36 districts of Punjab. Share this page with your friends and relatives on Facebook, Twitter and on other social website. Keep visiting our website JobsAlert.pk for latest updates related to jobs.